A Pretoria pastor who has been ‘blessing’ his congregants by making them eat ants, rats, snakes and even grass has sparked a call for religions to be regulated by the Culture, Rights and Linguistic Communities Commission. Chairwoman Thoko Xaluva said she would propose regulation to stop people like ‘snake pastor’ Penuel Mnguni of the End of Times Disciples Ministries. The SPCA has also laid charges against the self-proclaimed prophet. But is regulating the religious sector really the way to deal with wayward pastors and can the sector actually be regulated? By RUSSELL POLLITT. Right from the outset it must be said that Pretoria pastor Penuel Mnguni’s actions in forcing his congregation to eat ants, rats and snakes was outrageous and his justification for them (Romans 14) was a misuse of scripture. The text was taken out of context, a practice that can lead to ridiculous actions – as Mnguni proves. An orthodox Christian view would hold that what Mnguni did is not only wrong but fundamentally unChristian. The essence of Christianity is about being in a right relationship with self, others and God and not about ‘proving’ anything by dining on rats or snakes. The South African Council of Churches (SACC) and the National Interfaith Council of South Africa have condemned what happened. 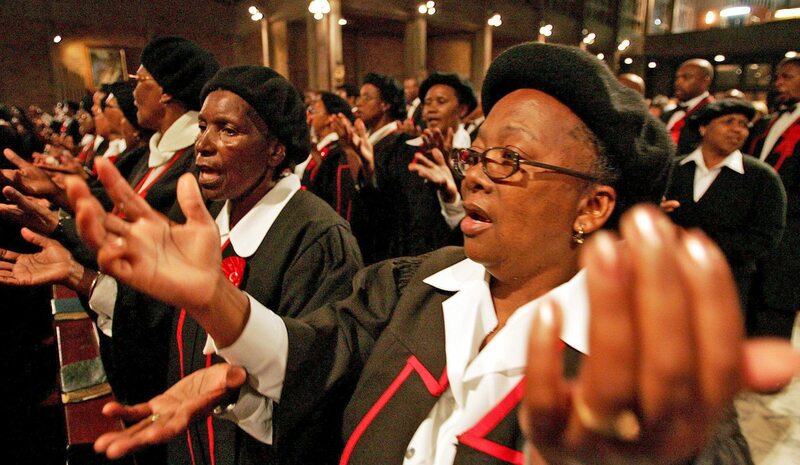 Bishop Joe Seoka of the SACC called Mnguni’s actions ‘immoral’. The Interfaith Council’s Reverend Thamin Mvambo said such practices are harmful to society and commercialise religion. “Any kind of religion that propagates ideas that are unacceptable; we cannot support that,” he said. Despite that fact that major religious bodies in the country have come out strongly against the snake pastor there are now calls for the religious sector to be regulated. It’s the South African way to deal with problems it seems: articulate a litany of regulations (more red tape) or, in other cases, set up an ‘investigative committee’. Is this really going to help? No, it won’t. The kinds of churches that it would ‘need’ to regulate are the very ones that are least likely to be regulated. Many are small one-person operations, operating informally, sometimes even out of tents or in open fields. Moreover, how does one regulate belief? Do we go the ‘Chinese route’, creating official state churches and religions – and run the risk of violating the constitutional right to freedom of thought and religion? The very fact that a number of religious bodies have (jointly) condemned what happened should indicate that Mnguni’s actions are not acceptable to the religious community itself. Methodist Bishop Paul Verryn said what Mnguni did was absurd. He believes two critical conversations need to take place. The first must be with the people who choose to follow these rogue ‘pastors’. “We live in a society that is not healthy, people will do anything out of desperation and we need to understand how this desperation leads to allowing oneself to be manipulated like this,” he said. “But I think we also need to have a conversation with the pastors themselves to try and understand their reasoning and foundation for this craziness.” He added that when there had been any violation of rights or law the relevant authorities – such as the Human Rights Commission, for example – must become involved. “More regulation will do nothing to help us,” Verryn said. The religious community itself needs to acknowledge that many of these ‘overnight’ communities have pastors who have little to no theological training. This is dangerous as it often leads to a literal fundamentalist interpretation of texts, the rejection of critical thinking (you must leave your brain at the door) and crazy actions – like snacking on snakes. Sometimes we need to take into account that such people are also not psychologically sound and therefore no regulation will stop them. Another factor that cannot be discounted is that some of these ‘pastors’ are about business (and making money) more than anything else. As things stand, someone can proclaim himself a bishop, manipulate people into following him, and set up shop. Even more distressing is that the people who are most likely to follow, and often become the victims to these kinds of set-ups, are those who are desperate. It is this kind of religion, no doubt, that led Karl Marx to write “religion is the opium of the people”. Seoka alludes to this when he says: “There is no supportive evidence of what he (Mnguni) is doing; it’s all about himself and I think he is taking advantage of people’s poverty.” It’s no secret that religion can be used as a tool for exploitation and when this happens people from within need to speak out. Just as there are plenty of political opportunists, there are many religious opportunists. The faith community must call these opportunists out and find ways of ensuring accountability. Bodies like the SACC or the Interfaith Council should speak out about the importance of theological training. University faculties of theology should be encouraged to engage with the general public on these matters. Mainstream churches (and religious bodies) need to be more aggressive in their condemnation of the lunacy. Some churches already insist on lengthy study and preparation for the ministry and do try to regulate those they ordain. These include criminal background checks on prospective clergy, psychological evaluations and intense pastoral preparation. Besides self-regulation there is another factor that must not be overlooked. Religious bodies, like any other body in the country, are subject to the law of the land and the Constitution. Freedom of religion is enshrined in the Constitution but this cannot violate other freedoms or laws. Let’s look at a practical example: Section 15 of the Constitution upholds freedom of religion, belief, and opinion. Section 12 upholds the right of freedom and security of the person that legislates against punishment in a cruel, inhuman, or degrading way. If a religion says that it believes in corporal punishment in schools, it clashes with Section 12. However, Section 36 of the Constitution (Limitations of Rights) tries to balance rights. Using this section the courts have ruled in favour of Section 12 over the rights enshrined in Section 15. (Christian Education South Africa vs Minister of Education 2000). Religions, therefore, do not have absolute freedom in their practices but are subject to the rights in the Constitution and the law and must abide by them. Religious bodies and their leaders are not and should not be above the law. Orthodox Christianity would hold that its followers should submit to legitimate civil authority. At the same time, secular democracy has no right to determine who may lead faith communities or how to interpret sacred texts or doctrines. This is the role of the communities themselves. Naturally, if such interpretations or actions violate the rights of other citizens (believers or nonbelievers) or do them actual harm, it may be the duty of the civil authority to respond according to the laws of the land.